Stomach cancer is the fourth most common cancer and the second leading cause of cancer-related death in the world [1-3]. It remains very difficult to cure effectively, primarily because most patients present with advanced diseases . Therefore, how to find early gastric cancer cells is a great challenge for early diagnosis and therapy of patients with gastric cancer. We have tried to establish an early gastric cancer warning system since 2005 , and hoped to find early gastric cancer cells in vivo by multi-mode targeted imaging techniques [6,-14]. However, the research was hampered by the lack of specific biomarkers to detect early gastric cancer. Searching for specific biomarkers of early gastric cancer has become our concern. One promising technology is the analysis of volatile metabolites that are released from cancer cells [15-19]. Volatile organic compounds (VOCs) that are emitted from cancer cell metabolism are considered to be important indicators for biochemical processes occurring in cancer cells [20, 21]. Analysis of VOCs may be capable of prognosticating and diagnosing early cancer. Compared with genomics and proteomics, volatile metabolites embody pathway feedback mechanisms, which highly indicate the potential pathophysiological progress in cancer cells [22, 23]. To a certain extent, volatile metabolites represent the status of cancer cells. Looking for volatile biomarkers from gastric cancer cells and developing ultrasensitive detection method will be helpful for early warning and diagnosis of gastric cancer. Recently, great advances in screening volatile biomarkers associated with cancer have been made. For example, common cancers such as lung cancer, breast cancer, melanoma, and colon carcinoma have been confirmed to exist specific volatile biomarkers [24, 25]. Peng, et al. reported a novel method to diagnose early lung cancer using gold nanoparticles combined with VOCs profiles . Because of its non-invasive, easily collected samples, and easily repeating detection, this novel cancer diagnosis method based on VOCs profiles exhibit great potential in clinical applications. Buszewski, et al. investigated the volatiles emitted from gastric cancer tissues and cultured helcobacter pylori bacteria (Hp), results showed that eighteen compounds were identified in stomach tissues, of which the amount of 1-propanol and carbon disulfide in the gaseous composition is higher in cancer tissue than in normal tissue, Hp bacteria present in the stomach might cause the increase in the concentration of 1-propanol and carbon disulfide in emission from cancer tissue [27, 28]. However, so far few specific volatile biomarkers associated with early gastric cancer cells were reported. Therefore, looking for specific volatile biomarkers associated with early gastric cancer cells is still our focus. Up to date, isolation and identification of biological VOCs are mainly performed by gas chromatography coupled with mass spectrometry (GC-MS), which can analyze multiple compounds simultaneously with a high sensitivity. However, this technique requires complicated procedures for detecting trace volatile compounds. Usually, samples are needed to pre-concentrate and extract with solid-phase microextraction (SPME) before GC-MS analysis [28, 29]. This process is time-consuming and the equipment is expensive. So the development of a non-invasive, quick and portable approach to detect VOCs has become a hotspot. Electrochemical biosensors that utilize nanomaterials as building blocks offer a lot of advantages and have attracted the attention of many research groups. For example, Zhang, et al. fabricated a three-dimensional (3D) architecture by combining nitrogen-doped carbon nanotubes, thionine, and gold nanoparticles via a simple layer-by-layer method to evaluate cell surface carbohydrate and glycoprotein. This biosensor showed excellent analytical performance for the detection of HeLa cells with a lower detection limit of 500cells mL-1. Bali, et al. reported a dual-template imprinted polymer film containing dispersed multi-walled carbon nanotubes ceramic electrode was successfully used for ultra trace simultaneous analysis of ascorbic acid and dopamine, which was large enough to allow selective and sensitive analysis of one in the presence of other, without any cross reactivity, interferences and false-positives . Espinosa, et al. reported that multi-walled carbon nanotubes (MWNTs) covered with gold or silver nanoclusters, as gas sensitive materials, could improve the selectivity of sensors [32, 33]. We also prepared bio-mimetically synthesized Ag@BSA microspheres as a novel electrochemical biosensing interface, realized KB cells with a lower detection limit of 20cells mL-1 . We also used self-assembly of multi-walled carbon nanotubes and quantum dots to realize the ultrasensitive detection of DNA and antigen . These examples fully demonstrate using carbon nanotubes and noble metal nanoparticles to develop ultrasensitive electrode interfaces is a good design strategy for fabricating new generation of electrochemical biosensors, because the nanocomposites of CNTs/nobel metal nanoparticles could enhance the performance of electrochemical biosensors [36, 37], for example, to improve the sensitivity of electrochemical sensors and to increase electron-transfer resistance because of their nanostructure and large surface area [38-40]. In recent years, nobel metal nanoparticles, especially bimetallic nanoparticles, for example, Au-Ag alloy nanoparticles, because of synergistic catalytic abilities, and selectivity of electrochemical reactions, exhibit great potential in development of new generation of electrochemical biosensors [41-43]. In this study, we report that the potential volatile biomarkers associated with gastric cancer cells were identified by SPME/GC-MS, using advantages of carbon nanotubes and nobel metal nanoparticles, a new electrochemical sensing interface, composed of Au-Ag alloy nanoparticles coating multi-walled carbon nanotubes (MWNTs) were prepared, two volatile biomarkers of gastric cancer cells screened were used as the detection targets, a new electrochemical biosensor detection system with high sensitivity and selectivity was developed. The identified volatile biomarkers of gastric cancer cells and established electrochemical biosensor may have great potential in applications such as early screening and the pre-warning of gastric cancer in near future. MGC-803 gastric cancer cell line and GES-1 gastric mucosa cell line were cultured in RPMI 1640 media containing 5% heat-inactivated fetal bovine serum. The cells were detached using trypsin and harvested by centrifuging at 1200 rpm/min for 3 minutes, and then they were counted with a hemacytometer and reconstituted with fresh media and were seeded into a 75 cm2 sealed cell culture flask with 40 mL of serum-free cell media at a density of approximately 1×106 cells/mL. The flasks were incubated at 37 ºC for the desired time in a humidified atmosphere of 5% CO2 (V/V) with a control group that contained the same volume of media without cells, reaching a typical confluence of 70~80%. The VOCs from cell metabolism and cell-free media were extracted and pre-concentrated by HS-SPME (headspace solid-phase microextraction). 20 mL airtight vials were thoroughly cleaned, sterilized and baked at 120 ºC for 20 hours before use. 10 mL of medium with cells cultured for 22 hours was transferred from the flasks to HS vials and sealed tightly with a PTFE septum. The cell free media that was subjected to identical conditions was set as the experimental control. A 57330-U manual holder and 75 μm CAR/PDMS coating was used for the HS sampling of the VOCs. Before the first use, the SPME fiber was conditioned in a GC injector at 280 ºC for 1 hour. The blank desorption of the fiber was performed under identical oven temperatures to clear localized background influences. Next, sampling was performed by introducing the SPME fiber into the headspace of the glass HS vial containing cell media samples through a PTFE septum in a hermetically sealed cap and exposing it for 44 min in a 38 ºC water bath. A teflon stir bar was used and driven by a magnetic stirrer. To avoid the condensation of released VOCs, the parts outside the water bath were kept at 38 ºC. All the vials were thermostated at 38 ºC for 10 min before SPME sampling. After sampling, the fiber was desorbed in a GC injector at 280 ºC within 2 min splitless times at a split ratio of 1:20. Helium was used as a carrier gas with a linear velocity of 44.2 cm·s-1. The analysis was performed on a GC/MS (QP2010E, Shimadzu). The separation and detection were performed on a 30 m×0.25 mm×0.25 μm Rxi-5 ms capillary column. The oven temperatures were as follows: initial 40 ºC, held for 5 min and then ramped at 10 ºC min-1 to 260 ºC and held for 10 min. The MS analyses were conducted in a full-scan mode, with a scan range of 42-400 a.m.u. The electron impact ionization was used at an energy of 70 eV. The temperatures of the ion source and the quadrupole were 200 ºC and 250 ºC, respectively. A comparison of volatile biomarkers between the MGC-803 and the GES-1 cells was performed. The different substances were identified by spectral match with the National Institute of Standards and Technology (NIST) 2008 MS spectral library (Gatesburg, PA, USA). To ensure the maximum reliability of the results, the identification was performed not only by spectral library match using the NIST 08 library, but was also verified by confirmation of the retention time for compounds with a similarity coefficient over 85%. The BRENDA database was used for the initial correlation between the detected compounds and the metabolic pathways . An acid-treated MWNTs water solution (0.1 mg/mL, pH=7.5) was provided by Qifa Liu, Ph.D from Shanghai Jiao Tong University. 1 mL of 0.1 mg/mL MWNTs water solution was added to a 20 mL vial, followed by the addition of 1 mL of 10 mM HAuCl4 solution and 1 mL of 10 mM AgNO3 solution. The reaction mixture was adjusted to 15 mL with ultrapure water and stirred continuously at 25℃ for 12 h for MWNTs that were loaded on Au-Ag nanoparticles. The MWNTs that were decorated with Au-Ag nanoparticles were studied by Scanning Electron Microscopy (SEM), transmission electroscopy (TEM) and Energy-dispersive X-ray spectroscopy (EDS) analysis. For comparison to MWNTs/Au-Ag alloy nanocomposites, MWNTs loaded with Ag nanoparticles or Au nanoparticles were prepared respectively, 2 mL MWNTs water solution (0.1 mg/mL, pH=7.0) was added to vessels followed by the addition of 2 mL of 10 mM AgNO3 or 2 mL of 10 mM HAuCl4 solution. The mixture was adjusted to 15 mL and stirred at 25 ℃ for 12 h [45-48]. The glass carbon electrode (GCE) was polished with 0.03 µm alumina powder on a micro-cloth and then thoroughly cleansed ultrasonically with ethanol and doubly distilled water, respectively. The clean glass carbon electrode was dried with N2. The clean glass carbon electrode was dried with N2. 20 μL of MWNTs/Au-Ag alloy composite solution were dropped onto the surface of the GCE and air dried. All the electrochemical experiments were performed with a CHI660D electrochemical workstation (CH Instruments, USA) using a conventional three-electrode cell at room temperature. The working electrodes, CHI150 saturated calomel electrode (SCE) and a platinum wire, were used for reference and auxiliary electrodes, respectively. The modified electrodes were positioned in 20 mL of 0.1 M KCl solution. For the deoxygenated experiments, KCl solution was bubbled with high-purity nitrogen for 15 min, and the nitrogen condition was maintained during the experiments. A cyclic voltammetric scan (-0.5 ~ 0.5 V) was applied to the working electrode until the current maintained a steady state. The electrochemical test was described as follows: the steady MWNTs/Au-Ag/GCE was put in the headspace of samples for 45 min to adsorb the volatile biomarkers. Then, MWNTs/Au-Ag/GCE put in the three-electrode cell. In order to compare with MWNTs/Au-Ag/GCE, MWNTs/Ag/GCE, MWNTs/Au/GCE, MWNTs/GCE and bare GCE were set as control. Finally, the electrochemical test was carried out in 0.1 M KCl at 60 mV/s from -0.5 to 0.5 V.
All the data are presented in this paper as the mean result ± S.D. Significant differences were evaluated using the t-test and considered significant at P < 0.05. The influence of headspace pre-concentration time by SPME on the chromatograms of cultured cells was investigated. To obtain better chromatograms, different extracting times (30 min, 45 min, and 60 min) were used to pre-concentrate volatiles in the headspace of samples. As shown in Fig. 1A, the optimal pre-concentration time of HS-SPME was 45 min, which was strongly preferred to perform the GC-MS analysis in our study. Besides, these volatiles are time-dependent and occur in very low concentrations. Different incubation time (12 h, 24 h, and 36 h) were used in our study. Meanwhile, cell culture flasks were protected with Parafilm. It was observed that significant increase in the emission of VOCs at 24 h. We found that cell viability decreased with incubation time. Cell culture flasks protected with Parafilm could substantially improve the chromatogram profile of volatile metabolites (Fig. 1B). Under optimized conditions, eight different volatile compounds between MGC 803 cells and GES-1 cells were identified reproducibly and summarized in Table 1. The patterns from the chromatogram of VOCs from MGC-803 gastric cancer cells that were influenced by: (A) headspace extraction time; (B) MGC-803 cells cultured with and without Parafilm. Summary of different VOCs between MGC-803 cells and GES-1 cells. Notes: +: VOCs present; -: VOCs absent; different numbers of + stands for different concentrations. Fig.2 is a representative chromatogram illustrating different volatiles in the headspace from the MGC-803 cells, the GSE-1 cells and the culture medium. Among the eight different compounds (peak 1-peak 8), peak 2 (Fig. 2A) and peak 6 (Fig. 2B) were only present in the headspace of the MGC-803 cells. Further analysis identified them as 3-octanone and butanone. Additionally, three compounds, formic acid propyl ester (peak 1), 1.4-butanediol (peak 3) and dodecane, 2, 6, 11-trimethyl (peak 8), solely existed in the headspace of the GES-1 cell media. Compounds such as 4-Isopropoxybutanol (peak 4), nonanol (peak 5) and 1-butanol, 4-butoxy (peak 7) were higher concentrations in the headspace of the GES-1 cells compared to the MGC-803 cells. The ratio of the relative peak area of them between the GES-1 cells and the MGC-803 cells were 4-Isopropoxybutanol ≤ 0.3, nonanol ≤ 0.36 and 1-butanol (4-butoxy) ≤ 0.40. We firstly identified volatile biomarkers to distinguish MGC-803 gastric cancer cells from GES-1 gastric mucous cells by HS-SPME/GC-MS. We attempted to optimize the methods of preparation and pre-concentration of samples. It is well known that the majority of VOCs are intermediate products of cell metabolism. So the cell culture period has a significant influence on the profile of VOCs chromatograms. Furthermore, biological VOCs are volatile with very low concentrations. The cell culture flask protected with Parafilm can avoid the omission of volatile biomarkers and environmental interferences. Therefore, the culture time and culture conditions were optimized in this work. Under the optimal conditions, with the same headspace-to-liquid volume ratio, the magnitude of the extracting effect of the VOCs was larger than that with lower headspace volume. According to the protocol reported [27-29], 10 mL of cell media was introduced into 20 mL of vial headspace for HS-SPME. Furthermore, extraction time is also an important factor. The shorter sampling time (30 min) caused the lower extractable absorption of analytes as a result of the reduced sensitivity of SPME. The longer HS pre-concentration time (60 min) enabled competitive absorption, which could result in a lower efficiency for extracting compounds and some valuable biomarkers may be lost. Finally, a 45 min HS-SPME sampling time was strongly preferred in this work and showed good sensitivity. Our data showed that the amount of alcohols or aldehydes in the headspace of the MGC-803 cells were higher than those in the GES-1 cells. These phenomena should be attributed to the higher activity of aldehyde dehydrogenase in cancer cells [48-50]. Alcohols or aldehydes were oxidized to the corresponding carboxylic acids in an alcohol dehydrogenase-independent pathway; carboxylic acids were further metabolized as precursors of the synthesis of cell membranes, which provide more substances to meet the rapid growth requirement of cancer cells. Comparison of VOCs chromatograms from the headspace of the MGC-803 cells, the GES-1 cells and media culture: (A) the chromatograms with a retention time 8~13 min; (B) the chromatograms with a retention time 17~20 min. The nanocomposite of MWNTs/Au-Ag nanocomposites was successfully prepared. The MWNTs/Au-Ag composites were further characterized by TEM and SEM (Fig. 3A and 3B). The TEM and SEM images indicated that Au-Ag nanoparticles were loaded on the surface of MWNTs. The size and micro-structure of Au-Ag nanoparticles loaded on the surface of MWNTs was examined by high resolution transmission electroscopy (HR-TEM) in Fig. 3C. The HR-TEM images showed that the Au-Ag nanopartcles were spherical with diameters of 20~25 nm. HR-TEM also confirmed the formation of homogeneous gold-silver alloy nanocrystals, rather than either a segregated metal or a core/shell structure. EDS analysis was conducted and further confirmed that the composites comprised of carbon, gold and silver elements, as shown in Fig. 3D. 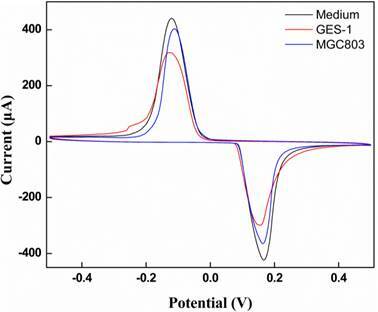 The electrochemical behaviors of different modified electrodes (MWNTs/Au-Ag/GCE, MWNTs/Ag/GCE, MWNTs/Au/GCE, MWNTs/GCE and bare GCE) in 0.1 M KCl at 60 mV/s from -0.5 to 0.5 V., and the CVs were shown in Fig. 4A. A pair of well-defined redox peaks was observed on MWNTs/Au-Ag/GCE. The current response of MWNTs/Au-Ag/GCE (Ip= 602.9 μA, Ep= -116 mv) is nearly 26 times stronger than that of MWNTs/Ag/GCE (Ip= 23.21μA, Ep= -176 mv), is far away stronger than that of MWNTs/Au/GCE. This suggested that the MWNTs/Au-Ag nanocomposites, as electrode sensing film, exhibited evident advantages over other nanomaterials. The phenomenon could be explained as follows: firstly, Au-Ag alloy with large surface area could enable fast electron-transfer . Secondly, MWNTs are known to not only can selectively adsorb gas molecules but also increase the surface area for Au-Ag alloy adsorption. So the better electronic conductive characteristics of MWNTs/Au-Ag/GCE were mainly attributed to the synergistic effect between the MWNTs and the Au-Ag nanoparticles. The CV curves of MWNTs/Au-Ag/GCE with different scan rates (20 mv-200 mV/s) are obtained in Fig. 4B. The cathodic peak currents of MWNTs/Au-Ag/GCE were directly proportional to the scan rates at a range of 20-200 mV/s (the inset of Fig. 4B; Ip=3.5035x+144.51, R=0.9909). This indicated that it is an adsorption-controlled process on the surface of MWNTs/Au-Ag/GCE. The electrochemical sensor was used to respectively detect different concentrations of butanone and 3-octanone in N2 matrix. With the concentration of butanone increasing, a gradual decrease of the anodic peak current (Ip) was observed with a negative shift of potential (Fig. 5A). The IP is linear in the concentration of butanone (C) range between 0 and 0.55 ppm with the detection of limitation (LOD) of 0.5 ppb (S/N=3). The regression equation (shown in the inset of Fig. 5A) is Ip= -9.8886C+445.92 with a correlation coefficient (r) 0.9986. At the same detection of 3-octanone was performed in Fig. 6B. The Ip also exhibited a good linear relationship with the concentrations of 3-octanone (C) in the range of 0~0.25 ppm with the LOD of 0.3 ppb (S/N=3). The regression equation (shown in the inset of Fig. 5B) is Ip= -18.8857C+309.0143 with r of 0.9956. It was observed that the electrochemical assay system can sensitively detect butanone and 3-octanone. Characterization of MWNTs covered with Au-Ag nanoparticles: (A) TEM image; (B) SEM image; (C) HR-TEM image of Au-Ag nanoparticles on the surface of MWNTs; (D) the corresponding EDX spectra of MWNTs/Au-Ag nanoparticles. (A) Cyclic voltammograms of MWNTs/Au-Ag/GCE, MWNTs/GCE, MWNTs/Ag/GCE, MWNTs/Au/GCE and bare GCE in 0.1 M KCl solution. (B) Cyclic voltammograms of MWNTs/Au-Ag/GCE in 0.1 M KCl solution with various scan rates (from a to g: 20,40,60,80,100,150 and 200, respectively). The inset is the linear plot between the anodic peak current and the scan rate. (A): The cyclic voltammograms of MWNTs/Au-Ag/GCE were exposed to different concentrations of butanone (from a to h: 0, 0.05, 0.1, 0.15, 0.25, 0.35, 0.45 and 0.55 ppm, respectively). The inset shows a line plot of the peak current (Ip) against concentration of butanone. (B): The cyclic voltammograms of MWNTs/Au-Ag/GCE were exposed to different concentrations of 3-octanone (from a to f: 0, 0.05, 0.1, 0.15, 0.2 and 0.25 ppm, respectively). The inset shows a line plot of the peak current (Ip) against concentration of 3-octanone. All the potentials are given versus SCE. Cyclic voltammograms of MWNTs/Au-Ag/GCE was exposed to the head space of cell-free medium, MGC-803 gastric cancer cells, and GES-1 gastric mucosa cells. The electrochemical assay system was used in real cell sample analysis to verify it the potential application . MGC-803 gastric cancer cell released specific volatiles in the process of metabolism. Theses volatile biomarkers have electrochemical activity on the MWNTs/Au-Ag/GCE. Fig. 6 depicts the CVs of volatiles in the head space of MGC-803 gastric cancer cells, GES-1gastric mucosa cells, and cell-free medium. When the MWNTs/Au-Ag/GCE was exposed to the head space of gastric cancer cell MGC-803, the peak potential moves to high potential with slightly decrease of peak current relatively to cell-free medium. However, compared with gastric cancer cell MGC-803, the peak current obviously decrease when MWNTs/Au-Ag/GCE was exposed to the head space of gastric mucosa cell GES-1 with no shift of peak potential. The results might be explained as follows: the butanone and 3-octanone had more electrochemical activity compared to other compounds shown in Table 1. According to the curves of CVs, MGC-803 gastric cancer cells can be easily discriminated from GES-1 gastric mucosa cells. 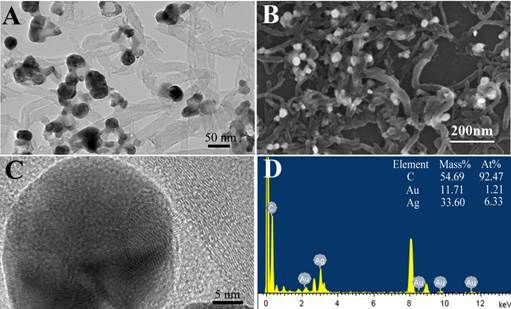 This result foresees the promising application of MWNTs/Au-Ag nanocomposite as electrocatalyst in sensing and detection of MGC-803gastric cancer cells. In order to investigate the cross-interference, we used CO2, acetone and ethanol as interference substances. No obvious change of the peak currents of 3-octanone and butanone was observed, suggesting that this electrochemical assay system based on MWNTs/Au-Ag/GCE has good selectivity. In conclusion, it is the first report to identify volatile biomarkers to distinguish MGC-803 gastric cancer cells from GES-1 gastric mucous cells with HS-SPME coupling with GCMS. An electrochemical assay system based on MWNTs/Au-Ag/GCE was developed to detect the volatile biomarkers associated with gastric cancer cells with high sensitivity, selectivity and no cross-interference. The specific volatile biomarkers of MGC-803 gastric cancer cells and the well-adapted electrochemical system have considerable potential in the near future for applications, such as screening and warning of early gastric cancer. Further work will focus on developing new generation of electrochemical biosensors for simultaneous detection of more VOCs biomarkers. This work is supported by the National Key Basic Research Program (973 Project) (No. 2011CB933100), National Natural Scientific Fund (No.81225010, 81327002, and 31100717), 863 project of China (2012AA022703), Shanghai Science and Technology Fund (No.13NM1401500 and 11nm0504200), Shanghai Jiao Tong University Innovation Fund for Postgraduates (No. AE340011). Corresponding author: Daxiang Cui, Address: 800 Dongchuan Road, Shanghai 200240, People's Republic of China. E-mail: dxcuiedu.cn.